I have finally fallen under the spell of visible random groupings. I was first introduced to the idea from Alex Overwijk, who credits Peter Liljedahl for the research and inspiration behind it. If you haven’t heard of Visible Random Groupings, the premise is pretty simple — on a regular basis, assign students to random groups, and make this randomization process visible to students. If students are choosing their own groups, some are likely to select groups that will not be productive. Keeping students in the same groups for too long leads to boredom or conflict. Random groups need to be visible so that students don’t believe, correctly or incorrectly, that they were put in the group because they are a “bright kid” or a “dumb kid”. What I’m really combating here is the idea that, in a group, students play a certain role — the role of the good student, the role of the hanger-on, or the role of the dullard. I send the message to students that we have new groups to hear more new, different perspectives, and to learn from everyone in the room. It’s the best tool I’ve found. 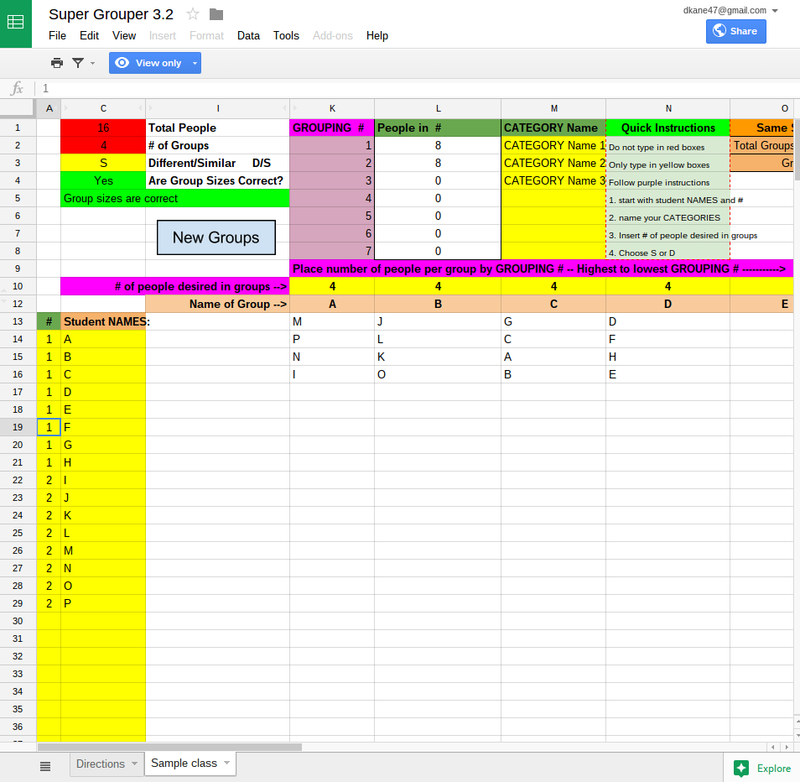 I can easily add and subtract students, change the number and size of groups, or just hit “new groups” again if I need to (there’s a couple in one of my classes that needs to stay separated to avoid endless uncontrollable giggling). I don’t have any assigned seats. Students come in and sit where they want for the warm-up and homework review. Once we get into doing some math, I usually start by using the Super Grouper to assign new groups. I’m teaching 90 minute blocks this year, and often do this twice or more a class. It adds energy to the room, brightens the lines between activities, and makes transitions that could feel stale more purposeful. I absolutely love it so far. Students got used to the idea very quickly, and many get excited when I pull up the spreadsheet on the projector. I’ve had remarkably few issues — although it’s worth noting that I think it’s totally fine to switch groups because of a social issue. The purpose is to send the message that groups are formed regardless of perceived mathematical ability. This entry was posted in Uncategorized on October 14, 2015 by dkane47. Thanks, Lisa! Flippity looks interesting, I need to check that one out.